Congratulations are in order for Digital Extremes, the team behind the third-person shooter, Warframe. Today, Warframe hits two milestones: firstly, it celebrates its six-year anniversary following release back on March 25, 2013. Also, Digital Extremes announced that Warframe is approaching 50 million players, which is impressive, considering the game’s slow start. But thanks to a dedicated development team, the game continued to pick up speed and is now one of the most popular free-to-play co-op shooters available. Digital Extremes sent out a press release today, detailing its achievements and is humbled by the growth of their project. To celebrate, they’re giving away a free gift to all Tenno on Wednesday, March 27th. 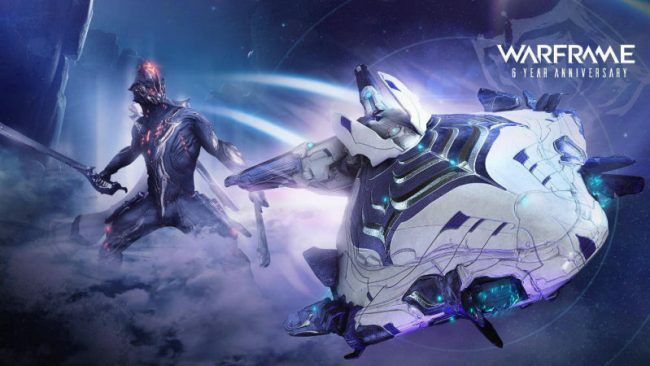 This includes an exclusive landing craft Liset Skin, a Dex Excalibur skin, and all previously released anniversary gifts. Warframe had around 38 million players as of March of 2018, but thanks to consistent updates and the release of the game on Nintendo Switch, it’s now nearing 50 million, just a year later. Digital Extremes has already released two major updates in the form of Nightwave and Operation: Buried Debts. Nightwave was the company’s first cross-over event that included fresh story-based content. With Operation: Buried Debts, we saw a huge update to Fortuna, which brought the introduction of Hildryn, Deck 12, and a new boss encounter. There are many more updates in the works, as well. The development team has been working on the Plains of Eidolon Remaster and Gas City Remaster updates, which include two new gameplay and graphical overhauls to refresh both areas. The team also promises to continue updating Warframe and encourages new players to jump in. After all, it’s free. Happy Birthday, Warframe and congratulations to Digital Extremes for their hard work and milestones reached with their game. Have you given Warframe a try? What are your thoughts? Let us know in the comments.